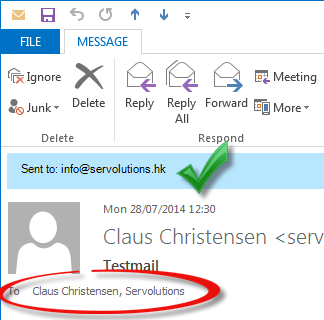 Do you have multiple email addresses configured in your Exchange mailbox? Then you’ll know this problem: Outlook only shows your name as recipient for all incoming emails, regardless of the email address that was used. Even if you check the details of the recipient (Outlook will show your ActiveDirectory entry) there is no sign of the exact email address used anywhere. AddressView for Outlook solves this problem. It works as an Outlook Add-In and shows the recipient email address in the Outlook email window above the usual From, To, CC etc. fields. You can test AddressView free of charge for 30 days and I personally found it quite interesting what I found out when I installed it myself: Finally I could see how many customers still reach us under our old company name and domain (@christensen-software.com). Please email or call any time if you have questions or suggestions!